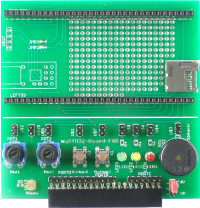 The mySTM32-Board-F4D functioned as an Add-On and it is an ideal addition to the board „STM32F0-Discovery“. The expansion board mySTM32-Board-F0D has additional digital and analog input and output devices known from the myAVR series for example potentiometer, button frequency converter and LEDs. An analog light sensor supports the use of different levels of brightness. 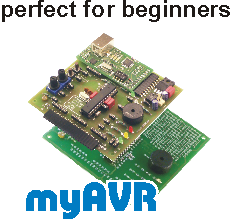 Through the typical myAVR interface you can combine the board with other products of myAVR. The board can be optionally equipped with a USB-UART bridge through the existing interface to communicate with the PC. The form factor is based on the proven principles of the didactic myAVR learning systems. The mySTM32-Board-F0D offers you the chance to employ the new 32bit technology in combination with the existing myAVR products. 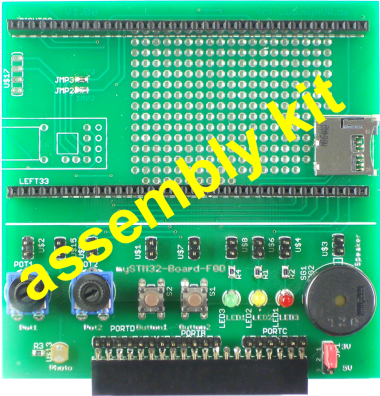 for connoisseur to the programming of 32 bit ARM microcontroller and make it easier for beginner to access. myUSBtoUART is not included in the delivery ! The „STM32F0-Discovery“ is the motherboard to the mySTM32-Board-F0D. The STM32F0-Discovery helps you to discover the functions and to develop easy applications of the STM32F0. It enables a fast induction at the ARM technology for beginner and advanced.